Who doesn’t know Dolby? Sitting down in the theater, seeing the logo before the movie, you know you’re in for a good time. 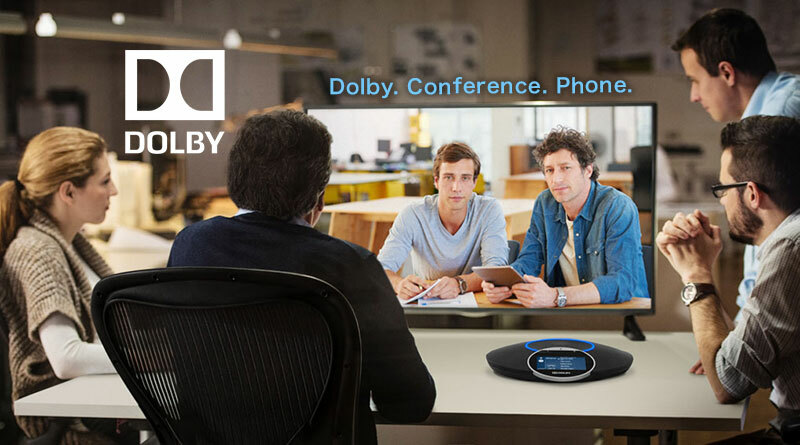 Dolby Conference Phone brings that Dolby sound to your office. Not only that: it looks good while doing it. Let’s start with the looks. Dolby Conference Phone is sleek, modern, elegant. It has a perforated grille in a dome shape that was based on a traditional Chinese wok. 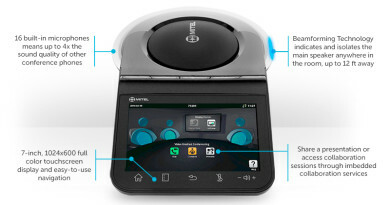 A circular display area holds an HD touchscreen display for easy operation. On top, you have an LED halo that provides a classy visual indication of status: blue for Dolby Voice call, green for SIP call, and red for mute. That design isn’t all for show, by no means. It’s the result of trying to build the perfect device for capturing the legendary Dolby audio in the office. Conference phone technology hasn’t changed that much in the last quarter century. 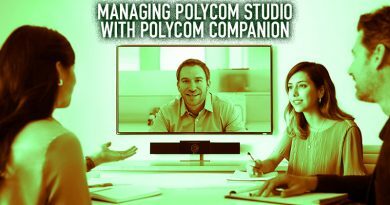 Dolby recognized that — they used the conference phones, after all — and knew that they could do better. When your team is talking in person, it’s the easiest thing for you to pay attention to and hear speakers, even if one person is next to you and another is at the end of table. The human ear naturally focuses. Audio conferencing technology still has trouble with this natural characteristic, which makes conferencing less than seamless. This is what Dolby has set out to solve. Dolby Conference Phone shines especially when used with a Dolby Voice enabled service, like BlueJeans. Dolby devised their own audio codec, DVC-2, which allows them to do more. 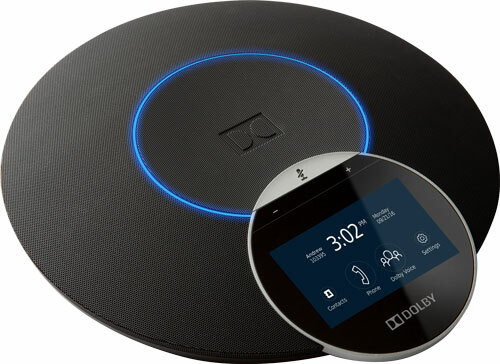 Using Dolby Voice, the conference phone provides class-leading voice separation. 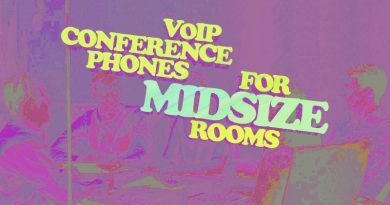 People are picked up by the conference phone in 360° out to 20ft. (Dolby’s being conservative with that “20ft”: it actually picks up voices out to 30ft or so just fine.) Dynamic leveling boosts distant or quiet voices while smoothing out close or loud voices, so the conversation sounds much more natural, as if you were focusing on speakers in the same room. Beyond that, each voice is presented in a specific location. 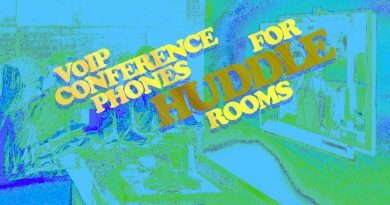 Think of it as something like surround sound, but from a single conference phone. You have to hear it to believe it! 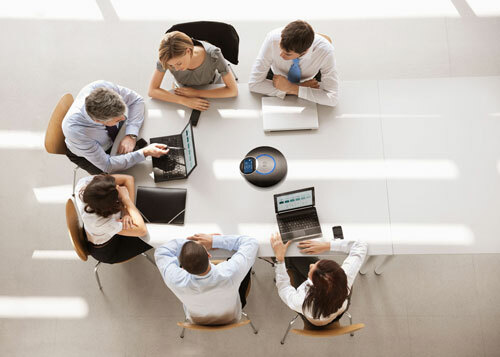 Dolby Voice is more than audio technology: it’s a simplified conferencing experience. This includes preconfigured access to compatible services. One-touch meeting start with a viewable roster of conference attendees. And you can manage it all using the touchscreen display. What if I don’t have a Dolby Voice service, you ask? Then you get one of the best SIP-based conference phones on the market today. The same conference phone works with both Dolby Voice and SIP. Dolby has verified Conference Phone to be interoperable with leading platforms, including Avaya, Broadsoft, Cisco, and Mitel. In either mode, you not only get dynamic leveling, but you also get class-leading noise reduction. 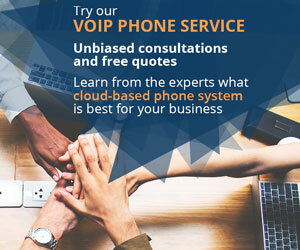 Because Conference Phone is an intelligent audio conferencing device, it’s able to reduce the distractions that you would, in person, naturally block out, but which, using a conference phone, are frequently so distracting. If you want to expand the reach of Conference Phone, Dolby offers the Satellite Microphone Kit. With this kit, you get two wired expansion microphones that match the elegant esthetic of Conference Phone. 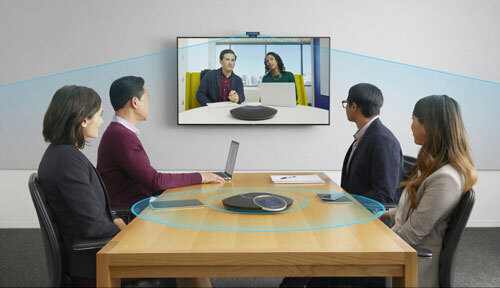 Each microphone picks up voices out to 6.5 feet, which extends the reach of the conference phone to fit even large conference rooms or meeting halls.